As much as I like sneakers, one problem with the modern running shoe is that after your kicks get worn out, you can’t resole them like you can a nice dress shoe. So inevitably, old sneakers end up getting tossed in the trash where they rot in a landfill somewhere for the next few decades or more. However, with some help from its forward-thinking FutureCraft design studio, Adidas has created the Loop, which includes some important innovations that could help reduce waste from shoe manufacturing, even if it hasn’t magically solved the problem yet. The Loop got its name because instead of being part of a dead-end pattern the sees million of sneakers get thrown away every year, Adidas has created a 100 percent recyclable sneaker, that can then be, worn, processed, shredded, and then reborn again as a brand new shoe, over and over again. Everything you see here was all created from TPU, including the laces. This isn’t the first time Adidas has suggested it’s interested in recyclable shoes. Where FutureCraft moves the concept forward is in using a single material to create the entire shoe: The upper, midsole, laces, and even the rigid torsion bar on the bottom are all variations of the same basic material, thermoplastic polyurethane (TPU). Developed by BASF and Adidas, TPU can be transformed into different shapes and textures just by changing the way the material is processed, largely through manipulating heat. Additionally, no glues or adhesives are used to construct the shoe, resulting in less waste, and making it easier to break down the shoe when it’s time to get to the dirty work of recycling. In the place of adhesives, Adidas is simply using heat to bind various sections of the shoe together. Here’s a shot of an early Loop prototype next to a more final version. Side-by-side, you can see how much more precise Adidas’ TPU manufacturing got. Even the translucent “windows” on the Loop’s upper are made from TPU by adjusting the temperature and other parameters of how the TPU is manipulated during creation. Any longtime Adidas fan will recognize the Boost midsole, which as you’ve probably guessed, is also made from TPU. From just one material, Adidas can create components with varying textures. Another important thing to note about Adidas’ grand plan, is that unlike other recyclable products that get down-cycled and turned into plastic bottles or used to make children’s playground, the Loop is intended to be up-cycled, meaning materials from the Loop will be reused to make future pairs of shoes and not other products. In addition to the Loop’s innovative manufacturing method, Adidas also wants to incentivize owners to take part in its recycling process with a cash reward. While Adidas is still working out the specifics, it’s planning on refunding between $10 and $20 or possibly more to owners for dropping their shoes off at a nearby store or sending them back in to be recycled. And to help remind people when it’s time, owners will even be able to register their shoe in an app using the QR code painted on the shoe’s tongue. While the first-gen Loop is made from 100 percent recyclable TPU, based on current manufacturing abilities, only around 10 percent of the material from first-gen Loops will find their way into the second-gen model, while the rest of the Gen-1 TPU will find its way into other Loop products. However, all of this optimism and innovation comes with a big caveat: That’s because while the first-gen Loops are 100 percent recyclable, right now, Adidas’ recycling process is only able to reuse 5 to 10 percent of that original material for use in crafting second-generation Loops. The rest of the recycled material will get put to use in making other Loop products. That’s not exactly what everyone might have in mind when they see the “100% recyclable” tag featured on the laces of the first-gen Loops. But I guess you have to start somewhere, and even being able to reuse the TPU in first-gen Loops to make components such as the outsole, eyelets, and tongue label seems like a promising beginning. 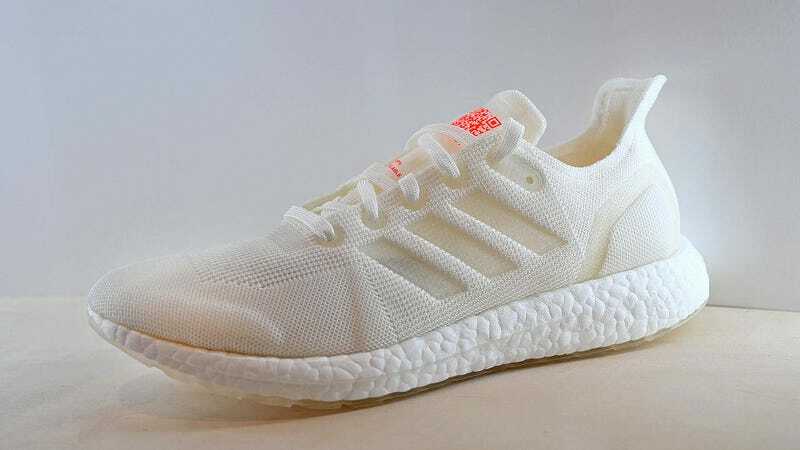 Furthermore, Williamson claims that Adidas already has more recent Loop prototypes with elements of the shoe featuring as much as 50 percent recyclable content, and if Adidas can increase the amount of recyclable material used in future generations, it may be possible for Adidas to hit or get close to its target around when the Loop officially launches sometime in the second half of 2020. So what’s going to happen to the Loop between now and 2020? Well, in addition to ironing out its recycling pipeline, registration process, and reward structure for the Loop, Adidas will also be seeding 200 pairs of shoes to lucky owners, who will then become the first testers in Adidas recyclable shoe project. Testers will be asked to wear the shoe for roughly six months before returning them so they can be shredded, processed, and potentially turned into a brand new pair. 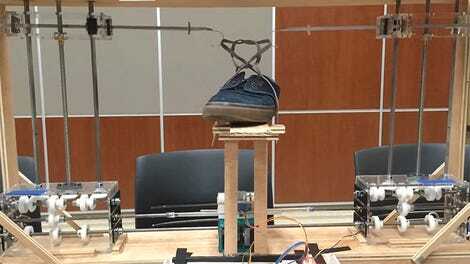 Is this the future of environmentally friendly shoes? There are a number of significant challenges Adidas will need to overcome before it’s achieved the Loop’s recycling goals, though overall, it seems like a move in the right direction. And with TPU being the material used to create the signature Boost sole found in so many of Adidas’ sneakers, if Adidas can nail recycling shoes with the Loop, it could have a major effect on the environmental impact of hundreds or thousands of shoes in the future. Correction: This post originally stated that there was a “catch” because the shoes were not 100 percent recyclable. The TPU in the shoes is 100 percent recyclable, however, only 5 to 10 percent of the recovered TPU can be used for a second generation shoe.